75% of Minnesotans Get Their Drinking Water From Groundwater — Let’s Protect It! Clean Water Action believes that everyone has a right to safe and affordable drinking water. To make this a reality, it is vital to put drinking water first. To do that it is important that elected and appointed officials at every level of government make decisions with drinking water in mind. That means they consider the downstream impacts on drinking water sources of agricultural, industrial, and every day activities and that they prioritize protecting drinking water sources. Unfortunately, Minnesota is not putting drinking water first. According to the Minnesota Department of Health’s Annual Drinking Water Report, 537 public water supply wells across the state have elevated nitrate levels, and roughly 10 percent of private wells in vulnerable areas already exceed health limits. The cost to treat drinking water for nitrates to make it safe to drink is high — 10 communities in Minnesota will face bills in the thousands of dollars per household. That is not affordable for all Minnesotans. The solution to these problems is to put drinking water first by addressing this problem at the source. Minnesota officials, farmers, and communities must find ways to reduce runoff from farm fields that contain excess amounts of nitrogen, which pollutes drinking water with nitrates. Nearly 75% of Minnesotans get their drinking water from groundwater sources. To protect groundwater and surface water resources, the legislature passed the Groundwater Protection Act in 1989. The Act directs the Minnesota Department of Agriculture (MDA) to promote voluntary pollution prevention by reducing the use of chemical fertilizer to grow crops. The MDA also has the authority to impose rules that limit cropland pollution of drinking water supplies if voluntary measures are not enough. Voluntary measures have not been enough. In response to this decades-old problem, the Minnesota Department of Agriculture has proposed a Groundwater Protection Rule to work with farmers and communities in places where nitrates in the water supply are already or are approaching unsafe levels. As of June 2018 the MDA engaged with more than 1800 people in 17 public meetings around the state. The agency has reviewed more than 800 written comments from the public. The two-part draft rules leave much to be desired, but it is a step in the right direction that will start the conversation and begin to implement solutions to protect our drinking water. The primary flaw in the draft rule is the reliance on adoption rates of nitrogen fertilizer recommendations — guidelines that were crafted to maximize profit, not to protect groundwater and drinking water sources. The draft rule lays out four levels of intervention when drinking water is contaminated. Each has criteria that determines if groundwater is not at risk because levels of nitrate do not exceed certain health based levels, or continues to the next step in mitigation to reduce the amount of nitrate in these drinking water resources. The MDA proposes to prohibit level three and four regulation based on adoption of “best practices” which were never intended to prevent drinking water contamination. These practices were created to help farm operations maximize profit, even at application rates the state acknowledges will lead to extremely high concentrations of nitrate in farm runoff. The University of Minnesota Extension’s Best Management Practices for Nitrogen Use in South-Central Minnesota, recommends that “Maximum Economic Return to N” or MRTN rates are used to calculate the economically optimal fertilizer application ratio. In the example used, the MRTN rate was found to be spring-applied at 120 pounds per acre. But Table 2 of that same document concludes that the recommended spring application of nitrogen fertilizer at 120 pounds per acre would yield nitrate loss at concentrations of 13.7 mg/l — a level well above the state’s Health Risk Limit of 10 mg/l. Clean Water Action is disappointed that this rule does not extend all protections to those Minnesotans who may need it most — private well-owners even though elevated nitrate levels have been found in private wells across the state. Many thousands of Minnesota families, especially in rural areas, rely on private wells for their drinking water. Yet these families will remain at the mercy of voluntary actions to protect their water — actions that have failed over the last generation. They will not receive even the modest drinking water protections that their neighbors in town will receive under this rule. Second, the pace of change built into the rule’s framework for well protection is far too slow. A farm operating on a public water supply wellhead area can go many years before being required to adopt the practices needed to effectively protect the community’s drinking water. Communities shouldn’t have to wait a decade or more for safe drinking water. All Minnesotans have a right to safe and affordable drinking water but the Groundwater Protection Rule does not go far enough to ensure farmers are doing what they can as quickly as possible to ensure clean water. Submit comments. Over the next 2 months the MDA is accepting written comments on the rule We need you to click here and send them comments that you want a stronger rule to protect all Minnesotans drinking water and do it in a timely way that protects our health. This rule represents a start and an opportunity to show that we can act to protect our drinking water supplies, so that everyone benefits — farm operators, local economies, and communities who drink the water. But we can’t protect just some residents; we look forward to working with MDA to strengthen the proposed rule to leave no residents behind. All Minnesotans have a right to clean, safe and affordable drinking water. We stand ready to work with Governor Dayton and his agency to stop any attempts to rollback their authority to act to protect our public health and water quality. And we will need your help in the coming months to make this a reality. If you are interested in getting more involved or have any questions, please contact Steve Schultz, Water Program Coordinator at sschultz@cleanwater.org. We look forward to hearing from you! 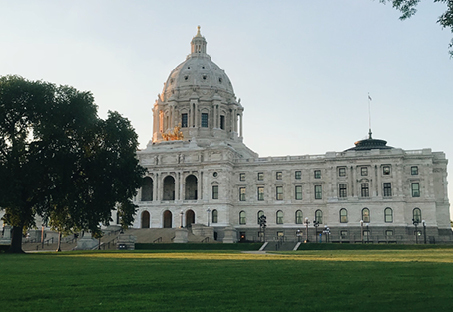 The Minnesota Legislature ended a three-month session just before midnight on Sunday, May 20th after sending Governor Mark Dayton a stack of bills, many of which he had already threatened to veto. Among the bills passed during the final days were three of the session’s biggest measures, including a tax bill, bonding bill, and a budget bill spanning more than 900 pages containing a multitude of objectionable provisions that undermine renewable energy, inhibit water quality protections, and more (you have heard about them if you get our emails). Within days, Governor Dayton vetoed both the tax and budget bills. In addition to defending attempts to weaken or repeal environmental protections, Clean Water Action worked to advance important legislation aimed at reducing chloride contamination in our waterways from winter salt application runoff and an appropriation for grants to fund lead risk assessments in low income multi-unit housing. Both initiatives were included in omnibus bills that ultimately became part of the budget bill but despite bipartisan support, both were removed during conference committee without discussion or public comment. Once again lawmakers failed to make protecting Minnesota’s environment and public health a session priority. If you want to find out how your legislator did, watch for the release of our Legislative Scorecard later this summer. We will be doing our best to hold them accountable in their districts and at the ballot box in November. In response to public pressure, Lowe’s Home Improvement announced May 29th that before the end of 2018 it will phase out two toxic chemicals used in paint-stripping products: methylene chloride and n-methylpyrrolidone (NMP). Lowe’s will become the first major retailer to end the sale of products containing the two chemicals, which have known health risks including cancer, nerve damage, fetal development, and even death. Lowe’s announcement comes after over a year of inaction by Administrator Scott Pruitt’s EPA, which has failed to finalize a rule to ban use of methylene chloride and NMP in the United States. At least four people have died since the rule was proposed in early 2017. As part of the national Mind the Store campaign, Clean Water Action’s Minnesota staff and members signed petitions, wrote emails to Lowe’s CEO Robert Niblock, called the company’s customer service line, and even delivered letters to store managers in the Twin Cities metro. Thank you to all who took action! Clean Water Action and Mind the Store will continue to ask Home Depot, Walmart, and Menards to follow suit and voluntarily phase out these toxic products. Great Lakes Day in Washington D.C. 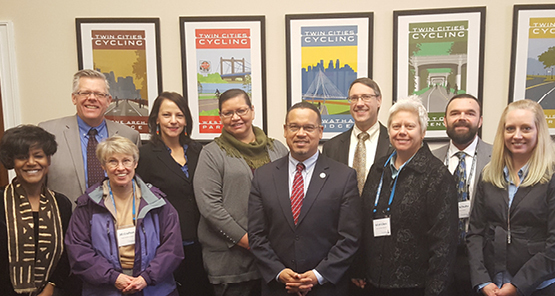 In March, eight Minnesotans went to Washington, D.C. for Great Lakes Day to continue to educate the Minnesota Congressional delegation about clean water and advocate for commonsense policies to protect water resources throughout the Great Lakes region. The group was joined by nearly 100 other advocates from around the Great Lakes region who were meeting with their representatives, from Wisconsin, Michigan, Illinois, Indiana, Ohio, Pennsylvania, and New York. For decades, Clean Water Action has led the fight to protect and restore Lake Superior and the Great Lakes because the Great Lakes contain 21% of the Earth’s available fresh water and provide the drinking water source for more than 40 million people. In addition, tourism to the Lakes brings in more than $16 billion annually to local economies in the region. Yet for more than a century the Great Lakes were like sewers and industrial waste disposal sites. No one wanted to face the consequences of these choices. If these are truly the Great Lakes, it’s time to do better. The situation for the Great Lakes began to change in 2010 when Clean Water Action and partners from around the lakes pressured Congress and President Obama to pass the Great Lakes Restoration Initiative (GLRI). With the support of members Clean Water Action members and thousands of Minnesotans, landmark legislation was passed to accelerate efforts to protect and restore the largest system of fresh surface water in the world — the Great Lakes. Since then, nearly $3 billion has been secured to restore and protect the lakes and the surrounding watersheds for future generations. Many of the issues that have plagued the Lakes for more than a century have begun to be addressed: agricultural pollution, sewer overflows, leaking septic tanks, habitat destruction, and the spread of invasive species. These efforts are helping to make the Great Lakes Great again! However, much more is needed to reach the lofty goals. President Trump continues to target the GLRI for cuts of 90% and 100% over the last two years. That’s why the team went to Washington to meet with representatives and senators. These bi-partisan lobbying efforts resulted in Congress restoring full funding for the GLRI at $300 million for the year and secured funding to protect sources of drinking water and fight invasive species that are threatening the lakes. Congress only takes action on these issues when they hear from constituents, and Clean Water Action made sure their members’ voices were heard. Even with this investment in the future of our lakes, it is going to take many more years to get to the point when all the Great Lakes are once again swimmable, fishable, and safe for all communities to get clean, affordable drinking water. They will only get there with the continuing support of Clean Water Action members. Thank you! Summer is almost here! In Minnesota, it is a time for hot, increasingly humid weather, and enjoying lakes, rivers, and streams to have fun and to cool down. It is also a time to think more about water and its connections to daily lives. Sometimes it might seem like there is not much that individuals can do to protect the health and vitality of Minnesota’s water because these problems seem too big. Increasingly though, everyone has a shared responsibility to do their part to protect water. How we use water at home, what happens to the rainwater falling in the yard, and what gets sent down the drain are all challenges that everyone should take responsibility for addressing. — Conserve electricity. The largest use of water in Minnesota is for energy production. — Turn off water when brushing your teeth and shaving. — Use low-flow showerheads and take shorter showers. 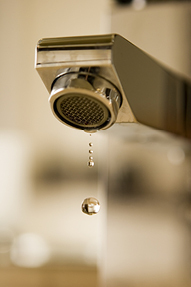 — Use low-flow aerators on the faucets in your house. --- Only wash a full load of dishes and clothes. Don’t pre-wash dishes but do scrape off large pieces of food. Modern dishwashers tend to use less water per load than washing by hand. — Store filtered tap water in a pitcher in the fridge instead of drinking bottled water. — Use green cleaning products that are safer for our waters as well as our families. Many of the most common cleaning chemicals have safer and less expensive alternatives. — Don’t dispose of household hazardous waste down the drain, in the storm drains or on the driveway. These include solvents, pesticides and paint. Contact your county to find your local hazardous waste disposal options. — Don’t dispose of medications down the drain. Instead, refer to the current Minnesota Pollution Control Agency guidelines for disposal of unused medications or contact your county sheriff. — Avoid watering your lawn except under severe drought conditions. Cool season grasses may turn brown and go dormant in the middle of the summer but will re-grow when rain and cooler weather returns. — Mow less. The longer your grass is the less water it needs to stay healthy, especially in drought conditions. It will also help cut down on Air Quality Alerts in the cities. — Use native plants appropriate for your area and plants that require a low water input. Native plants often require considerably fewer fertilizers and pesticides and less maintenance. — Harvest and keep rainwater on your site by using rain barrels, rain gardens, and permeable paving. Rains in urban areas wash over hard surfaces, moving large volumes of water, sediment, and pollution to sewers and nearby lakes, rivers, and streams. — Avoid leaving any yard waste and leaves in the street gutters, storm drains, or your driveway. This waste will eventually end up untreated in our waterways and increase nutrients in our lakes that leads to more algae blooms. Either dispose of yard waste as directed by your county or city or use the waste as compost or mulch. And make sure you sweep the street gutters and your driveway after mowing. — Other landscaping tips can be found at the University of Minnesota Extension Service. You will find that most of these tips have multiple benefits. They will save you money for your family budget, which you can spend on other fun things when you are out enjoying the lakes this summer. More importantly, individuals and consumers make many choices in our daily lives. These choices have consequences for Minnesota’s water. Using these tips, you will be a part of the solution to ensure Minnesota has clean water and healthy communities for generations to come! Have a great summer! Hundreds of Minnesotans (including many Clean Water Action staff and members) spent May 2 at the Capitol showing broad support for protecting Minnesota’s rivers, lakes, streams, and other water resources. Participants met with legislators throughout the day — asking them to oppose efforts to weaken protections for Minnesota’s waters and calling on them to adopt policies that protect every one of the state’s 10,000 lakes, along with the state’s wetlands and streams. 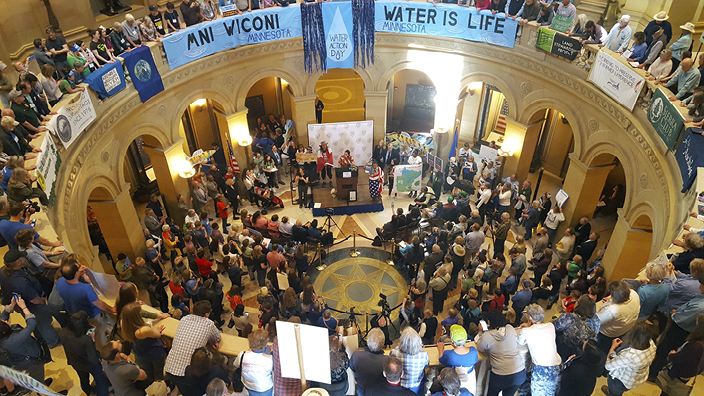 The Capitol rotunda was packed at the end of the day as speakers celebrated Minnesotans’ special connection with our waterways.